It’s been 85 years since Beach (his original name was Ernest Gantt) opened his first bar, Don the Beachcomber, in Los Angeles, and it’s been 65 years since the Beachcomber empire expanded to Palm Springs. But while what’s left of the tiki innovator’s chain has dwindled (there seems to only be a resort bar in Hawaii still bearing his name), a worthy successor has opened in the old Beachcomber space. That establishment is Bootlegger Tiki, and it is one of a handful of Palm Springs bars at the forefront of the tiki renaissance. Beach is often credited as the inventor of the tiki bar; the original Don the Beachcomber in Hollywood opened in 1933 and was a popular drinking spot for people like Charlie Chaplin and Greta Garbo. The Palm Springs outlet of Don the Beachcomber opened in 1953, with both a restaurant and its collection of rum-based drinks (now, Ernest Coffee – named after Don’s original first name – shares the space). Frank Sinatra is said to have been a regular, particularly admiring the Navy Grog cocktail. Trends change, of course, and by the time the Bootlegger Tiki opened in 2014, a little more than ten miles from Two Bunch Palms, the former Beachcomber had long been abandoned. But across the country, the rebirth of tiki had begun, as shows like Mad Men created a hunger for all things 1950s and ‘60s. The culture was at its zenith during those decades, as Hawaii joined the United States and island escape fantasies started coming true. With its emphasis on innovative mid-century modern architecture, Palm Springs makes perfect sense as a home-away-from-home for tiki aficionados. 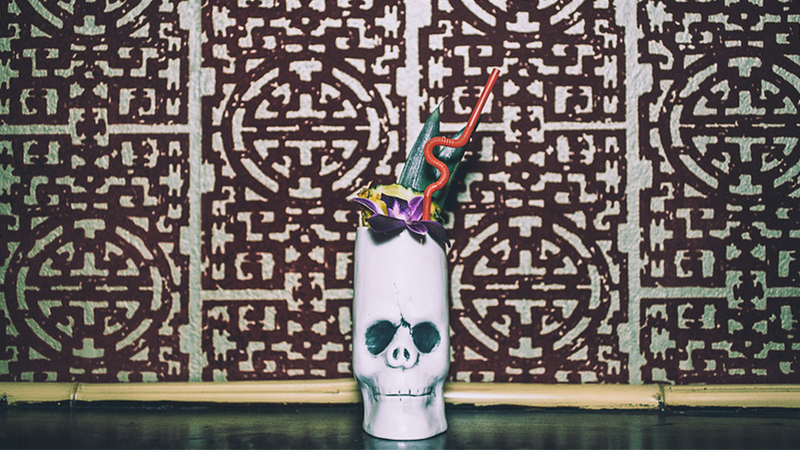 In the cozy, mood-lit atmosphere of the Bootlegger, classic tiki drinks like the Zombie (said to be made from Beach’s 1934 recipe) sit next to updated versions. The famous cocktail Three Dots and a Dash gets a south-of-the-border kick with mezcal, creating the Tres Puntos, for instance. And the Pod Thai, with its balance of coconut, rum, and cardamom, has become one of the bar’s most popular libations. The dimly-lit space lets one imagine sipping these drinks along a beach (and during the summer, taking cocktails to the patio area lets one at least experience that seaside heat). But the Bootlegger is not content to simply keep the spirit of tiki alive. 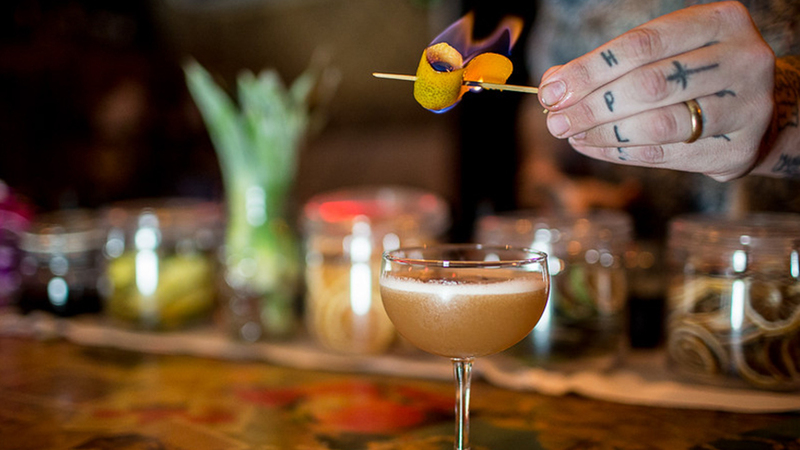 It also wants to spread it – and does so with its tiki cocktail classes, where guests can learn how to make the drinks they’re regularly ordering from the bar. 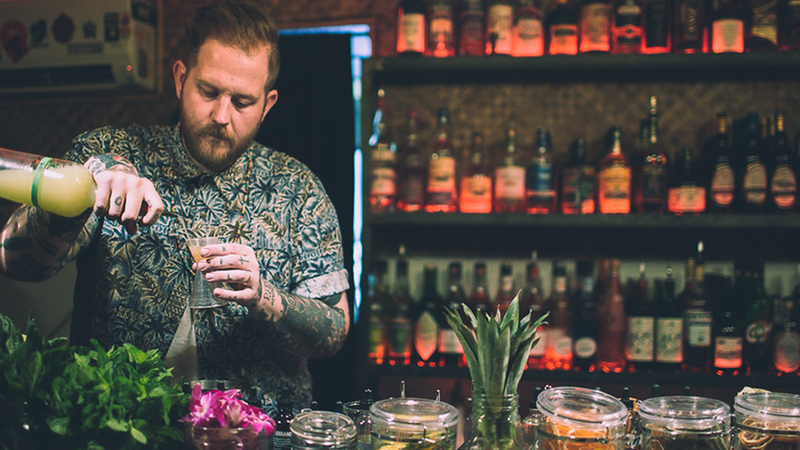 The Bootlegger may have the most direct connection to tiki history, but it’s not the only spot in the city slinging rum drinks. In fact, with Tonga Hut, The Reef, and Toucans Tiki Lounge offering up rum-forward drinks (some classics, some new interpretations thereof), Palm Springs has become something of an oasis for all things tiki, a place that resembles some of the culture’s best elements: a devil-may-care attitude, an escape from the humdrum of everyday life, an oasis. Maybe even, as Beach once said, a paradise. *All photos courtesy of Arlene Ibarra.